Shamsky’s short but memorable run with the Mets made him one of the most enduring Jewish players ever. Originally in the Cincinnati farm system, he hit 21 homers for the Reds in 1966. He tied the Major League record by hitting a homer in four straight at bats in August of that year. Before the start of the 1968 season, he was traded to the Mets. After hitting .238 with 12 homers in 1968, he actually started the 1969 season in the minors. 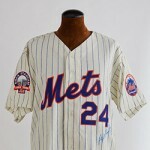 However, the Mets quickly brought him back to big leagues, and he became a key role player for the “Miracle” Mets. He hit .300 with 14 homers and 47 RBIs in 100 games. Then in the playoffs, Shamsky hit .538 with 7 hits in keying the Mets’ 3-game sweep over Atlanta. Shamsky had another good year in 1970, hitting .293. But he declined from there, as he closed out his career with St. Louis, the Cubs and Oakland. Yet thanks to that magical season, he has a lasting memory with Mets fans. In “Everyone Loves Raymond,” Ray and Robert’s childhood bulldog was named Shamsky. As an adult, Robert named his new bulldog Shamsky Number 2. Shamsky made an appearance in this series as himself. Shamsky roomed with Pete Rose in the minors.